Recent data indicate that phagocytosis mediated by FcγRs is controlled by the Src and Syk families of protein tyrosine kinases. In this study, we demonstrate a sequential involvement of Lyn and Syk in the phagocytosis of IgG-coated particles. The particles isolated at the stage of their binding to FcγRs (4°C) were accompanied by high amounts of Lyn, in addition to the signaling γ-chain of FcγRs. Simultaneously, the particle binding induced rapid tyrosine phosphorylation of numerous proteins. 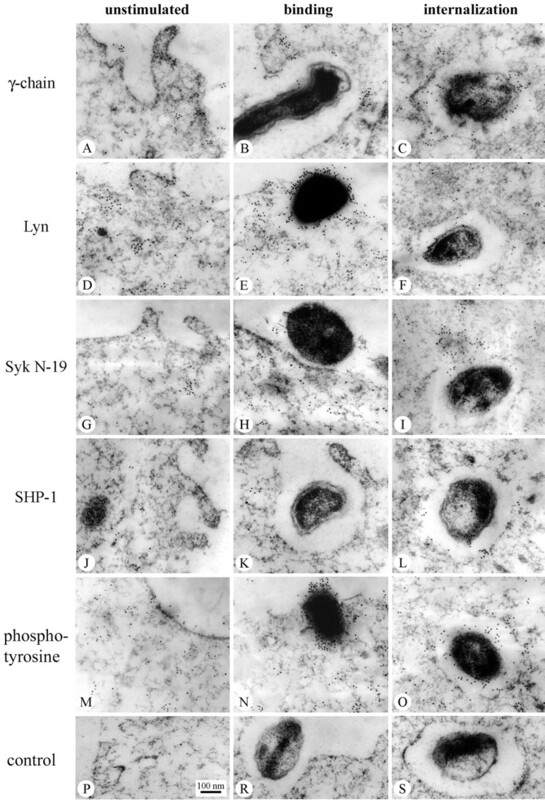 During synchronized internalization of the particles induced by shifting the cell to 37°C, Syk kinase and Src homology 2-containing tyrosine phosphatase-1 (SHP-1) were associated with the formed phagosomes. At this step, most of the proteins were dephosphorylated, although some underwent further tyrosine phosphorylation. Quantitative immunoelectron microscopy studies confirmed that Lyn accumulated under the plasma membrane beneath the bound particles. High amounts of the γ-chain and tyrosine-phosphorylated proteins were also observed under the bound particles. When the particles were internalized, the γ-chain was still detected in the region of the phagosomes, while amounts of Lyn were markedly reduced. In contrast, the vicinity of the phagosomes was heavily decorated with anti-Syk and anti-SHP-1 Abs. The local level of protein tyrosine phosphorylation was reduced. The data indicate that the accumulation of Lyn during the binding of IgG-coated particles to FcγRs correlated with strong tyrosine phosphorylation of numerous proteins, suggesting an initiating role for Lyn in protein phosphorylation at the onset of the phagocytosis. Syk kinase and SHP-1 phosphatase are mainly engaged at the stage of particle internalization. Phagocytosis is a reaction of the immune system to uptake and destroy invading microorganisms or senescent cells of the host and present internalized Ags to T cells. This process is mediated by specialized plasma membrane receptors that recognize specific ligands, opsonins, located on the surface of phagocytic particles. FcγRs are well-characterized components engaged in phagocytosis in macrophages, monocytes, and neutrophils (1, 2, 3). During phagocytosis, the specific interaction of FcγR with IgG-opsonized particle induces local clustering of the receptors. As a result, the tyrosine residues in the immunoreceptor tyrosine-based activation motifs (ITAMs)3 of FcγRIIA and the accessory γ-chain of FcγRI and FcγRIIIA are phosphorylated, and subsequently, phosphorylation of several downstream proteins occurs (2, 4, 5). Biochemical data demonstrate that Src, as well as Syk, family kinases are the enzymes activated by clustered FcγRs and that they play a crucial role in FcγR-mediated phagocytosis (6, 7, 8, 9, 10). The role of Src kinases was confirmed by experiments on Src-deficient cells in which the phosphorylation of FcγRIIA and phagocytosis were diminished (11). However, some data indicate that Src kinases are not absolutely required for uptake of particles. In hck−/−fgr−/−lyn−/− macrophages, FcγR-mediated phagocytosis did occur in a delayed fashion, and treatment of these cells with inhibitors of Src family kinases did not completely block phagocytosis (12). In contrast, in monocytes in which the expression of Syk was blocked by antisense oligodeoxynucleotides, tyrosine phosphorylation of FcγRIIA occurred but phagocytosis was completely inhibited (13). Similarly, studies of Syk-deficient macrophages derived from transgenic mice proved that the attendance of Syk is indispensable for phagocytosis (14). Cotransfection of Syk with the γ subunit of FcγRs conferred phagocytic abilities on fibroblasts (9). Moreover, a chimeric protein, constructed from the extracellular and transmembrane domains of FcγRIII and Syk kinase as the cytoplasmic part, was able to induce reorganization of the actin cytoskeleton and trigger phagocytosis (15). Comparison of the phenotypes of the hck−/−fgr−/−lyn−/− and syk−/− macrophages reveals that, in the absence of Syk kinase, the formation of actin cups was normal but internalization of particles did not occur. In contrast, the lack of kinases of the Src family led to a delay in actin cup formation but successful phagocytosis was achieved. These data suggest that Src and Syk family kinases have distinct functions in the propagation of a phagocytic signal generated by the FcγR (12) and indicate a sequential activation of Src and Syk family kinases by the FcγR. Studies on the cellular redistribution of Src and Syk family kinases during phagocytosis could verify the sequence of involvement of the kinases in the process. The aim of our study was to examine the cellular distribution of Lyn and Syk kinases at different steps of phagocytosis in J774 macrophage-like cells. We wanted to determine whether the kinases are sequentially translocated to the ligated receptors and the dynamics of their association with FcγRs when phagocytosis occurs. This is the first high-resolution immunogold observation of the sequential engagement of Lyn and Syk kinases in phagocytosis mediated by FcγRs. Mouse J774A.1 macrophage-like cells (American Type Culture Collection, Manassas, VA) were cultured in DMEM (Seromed, Munich, Germany) supplemented with 10% heat-inactivated FCS, 100 U/ml penicillin, and 100 μg/ml streptomycin. Before experiments, the cells were starved for 2 h in serum-free medium at 37°C in 5% CO2. The starved cells were detached mechanically by a rubber policeman and resuspended in serum-free medium at a concentration of 5 × 106 cells/ml. For phagocytosis, polystyrene latex beads (LB; 3 μm in diameter; Sigma-Aldrich, St. Louis, MO), zymosan A (ZA; 3–5 μm in diameter; Sigma-Aldrich), or magnetic particles (MP; 1 μm in diameter; Boehringer Mannheim, Indianapolis, IN) were used. Particles were suspended in PBS to 10 mg/ml and used for opsonization. The opsonization was performed by incubation of the particles in PBS containing 20 mg/ml rat IgG or BSA for 2 h at 37°C with constant shaking. The opsonized particles were collected by centrifugation (3000 × g, 5 min) and free protein-binding sites were blocked in 5% BSA in PBS for 30 min at 37°C. The particles were then washed and suspended again at 2 × 107 particles/ml in phosphated Dulbecco’s (PD) medium (125 mM NaCl, 5 mM KCl, 10 mM NaHCO3, 1 mM KH2PO4, 1 mM CaCl2, 1 mM MgCl2, and 20 mM HEPES; pH 7.4) and directly used for phagocytosis studies. Before experiments, the cells were washed and preincubated for 10 min in ice-cold PD. To promote binding of the particles to the cell surface, the cells were exposed to the opsonized particles at 4°C (20 particles/cell) and incubated with a delicate shaking. Unbound particles were removed by washing with ice-cold PD. The internalization of the bound particles was performed by shifting the cells to 37°C, and the cells were incubated with a delicate shaking. At various time points, the cells were pelleted and either fixed and used for electron microscopy studies or lysed and processed for immunoblotting analysis. The cells undergoing phagocytosis of opsonized LB were collected, washed in ice-cold PD medium supplemented with 1 mM Na3VO4 10 mM NaF, and 10 mM Na4P2O7, and lysed in 75 μl of ice-cold Triton/SDS lysis buffer (1% Triton X-100 (TX-100), 0.1% SDS, 150 mM NaCl, 2 mM EDTA, and 50 mM Tris-HCl; pH 7.5) supplemented with 1 mM Na3VO4, 10 mM NaF, 50 μM PAO, 2 mM PMSF, 20 mM Na4P2O7, 10 μg/ml aprotinin, 10 μg/ml leupeptine, and 10 μg/ml pepstatin A (4). Twenty minutes later, 3.5 μl of 20% SDS was added, and nonlysed material was pelleted (3000 × g, 5 min). The supernatant was complemented with 26 μl of 4× SDS-sample buffer, boiled for 5 min, and processed for immunoblotting analysis. 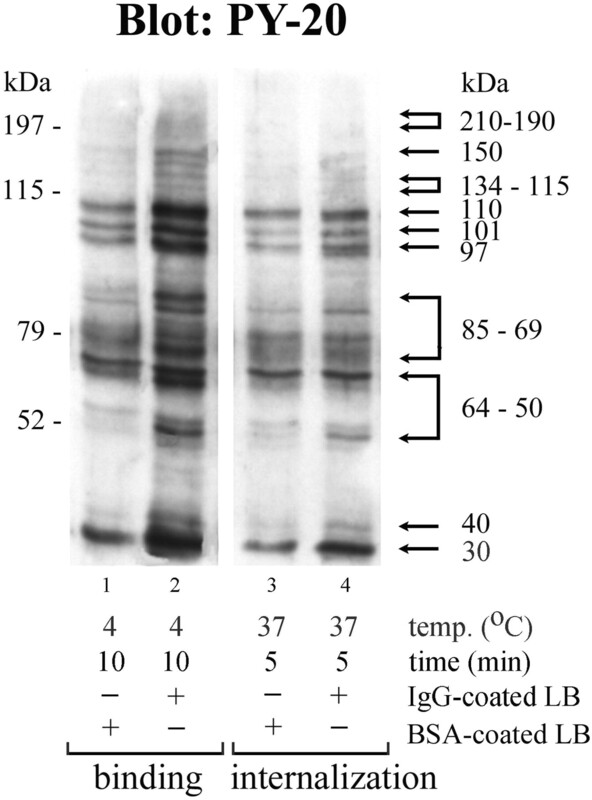 The cells undergoing phagocytosis of opsonized MP were collected, washed and solubilized in ice-cold Triton lysis buffer (0.1% TX-100, 150 mM NaCl, 5 mM EDTA, and 50 mM Tris-HCl; pH 7.5), and supplemented with the protease and phosphatase inhibitors mentioned above. After lysis (20 min, 4°C), MP were separated in a magnetic particle separator (Boehringer Mannheim). The isolated particles were resuspended in 60 μl of ice-cold Triton lysis buffer, and the suspension was supplemented with 16.2 μl of 4× SDS-sample buffer. The samples were boiled for 5 min and processed for immunoblotting analysis. The proteins (30 μg) were electrophoretically separated on 10% SDS-PAGE (16) and transferred to nitrocellulose sheets (17). After overnight blocking in 5% nonfat milk in TBS/0.05% Tween 20, the blots were washed in TBS/0.05% Tween 20 and probed for 1.5 h at room temperature with the following Abs: mouse anti-phosphotyrosine PY-20 (BD Transduction Laboratories, Lexington, KY), rabbit anti-γ-chain 934 (generously provided by Dr. M.-H. Jouvin (Beth Israel Deaconess Medical Center, Boston, MA)), rabbit anti-Lyn, rabbit anti-Syk (N-19 and C-20, directed against the N and C termini of Syk, respectively) and rabbit anti-Src homology 2-containing tyrosine phosphatase-1 (SHP-1) (C-19) (Santa Cruz Biotechnology, Santa Cruz, CA). In some experiments, rabbit anti-SHP-1 (generously provided by Dr. J. C. Cambier (University of Colorado, Denver, CO)) were also applied, yielding results corresponding to those obtained with the Santa Cruz Ab. After washing (six changes of TBS/0.05% Tween 20, 5 min each), the blots were incubated for 1 h at room temperature with appropriate secondary Abs: sheep anti-mouse IgG or sheep anti-rabbit IgG conjugated with HRP (Amersham, Arlington Heights, IL) or with biotin followed by streptavidin HRP (Sigma-Aldrich). All Abs were prepared in 2% nonfat milk in TBS/0.05% Tween 20. After washing, the immunoreactive bands were visualized using SuperSignal Chemiluminescent Substrate (Pierce, Rockford, IL). Luminescent images were analyzed in a Fluo-S MultiImager System using QuantityOne software (Bio-Rad, Hercules, CA). Molecular masses of polypeptides were determined based on their relative electrophoretic mobility using prestained molecular mass standards (Bio-Rad). At various time points of phagocytosis of opsonized ZA, the cells were collected, washed in PD at 4°C, and fixed with 3% paraformaldehyde/1% glutaraldehyde in 100 mM sodium phosphate buffer (pH 7.2) for 1 h at room temperature. The washed samples were dehydrated in an ethanol series at room temperature. The pelleted samples (3000 × g, 30 s) were suspended in 100% propylene oxide for 20 min at room temperature followed by incubation in mixtures of LR White resin/propylene oxide (Polysciences,Warrington, PA) at ratios of 1:2 and 1:1, each for 30 min. Finally, the samples were infiltrated twice with 100% LR White resin for 1 h at room temperature. The probes were polymerized at 55°C for 48 h. Ultrathin sections were placed on formvar-covered nickel grids and blocked in 5% FCS in PBS for 1 h at room temperature. After washing in PBS, the samples were incubated with different primary rabbit Abs (anti-γ-chain, anti-Lyn, anti-Syk (N-19 and C-20), anti-SHP-1 (all as described above), and anti-phosphotyrosine) for 3 h at room temperature in a humid atmosphere. After washing (six times in PBS/0.5% BSA/0.05% Tween 20, 5 min each), sections were treated with goat anti-rabbit IgG conjugated with 10-nm gold particles (Sigma-Aldrich) for 4 h at room temperature. In control samples, either incubation with the primary Abs was omitted or the samples were treated with rabbit IgG (Jackson ImmunoResearch Laboratories, West Grove, PA) followed by goat anti-rabbit IgG-10-nm gold. All Abs were prepared in PBS/0.5% FCS/0.05% Tween 20. After washing, the samples were counterstained with 2.5% uranyl acetate in ethanol for 15 min at room temperature in dark, washed in 50% ethanol and three times in distilled water, and stained with lead citrate for 2 min at room temperature. Finally, the sections were washed three times in distilled water and examined under a JEOL (Peabody, MA) JEM-1200EX electron microscope. The number of gold particles in cellular compartments (in cytoplasm, at the plasma membrane nonoccupied by ZA, at the membrane with bound ZA, and in phagosome region) was counted from five experiments and evaluated both per square micrometer of the compartment area and according to the number of gold particles per cluster. Earlier studies by Greenberg’s group (4, 6) demonstrated that the engulfment of particles mediated by the FcγR is accompanied by enhanced tyrosine phosphorylation of numerous proteins. We expanded Greenberg’s studies and examined the level of tyrosine phosphorylation of proteins at two distinct steps of phagocytosis: during particle binding and during internalization. The binding of IgG-coated LB to the surface of J774 cells induced rapid and transient tyrosine phosphorylation of polypeptides of 210–190, 150, 134–115, 110, 101, 97, 85–69, 64–50, 40, and 30 kDa (Fig. 1⇓, lane 2). The phosphorylation was most intensive during the first 5–10 min of particle binding. When internalization of IgG-coated LB started, most of the proteins were dephosphorylated, although some underwent further tyrosine phosphorylation (Fig. 1⇓, lane 4). The proteins of 64–50 kDa were likely to belong to the Src family kinases. The polypeptides of 75–69 kDa had been suggested to be Syk kinase and paxilin, respectively (4). In control samples, when LB were coated with BSA, the basic level of tyrosine phosphorylation was seen (Fig. 1⇓, lanes 1 and 3). Tyrosine phosphorylation/dephosphorylation of proteins during binding and internalization of IgG-coated particles in J774 cells. Binding of the particles to the cell surface was conducted at 4°C for 10 min. Internalization of the bound particles was initiated by warming the cells to 37°C for 5 min. Triton-SDS lysates prepared from the cells at the time of binding and internalization of IgG-coated LB or BSA-coated LB were separated by 10% SDS-PAGE and immunoblotted with anti-phosphotyrosine (PY-20) followed by secondary Ab conjugated with peroxidase. The molecular mass markers are indicated on the left and the Mr of several induced tyrosine-phosphorylated proteins (arrows) are designated on the right of the figure. To analyze which of the tyrosine-phosphorylated proteins are accumulated around phagocytic particles, the cells were exposed to IgG-opsonized MP. At different steps of the phagocytosis, the cells were solubilized in TX-100, and MP with associated proteins were quickly collected. We found that, at the binding step, among numerous proteins isolated together with the IgG-coated MP, the proteins of 134–115, 110, 101, 97, 85–69, 64–50, and 40–30 kDa were strongly tyrosine phosphorylated (Fig. 2⇓A, lane 2, arrows). When particles were isolated after 5–10 min of internalization, the proteins of 40–30 kDa were found to be further phosphorylated, whereas the phosphorylation of the others was reduced (Fig. 2⇓A, lanes 3 and 4). In control experiments, when MP were opsonized with BSA, some level of nonspecific phosphorylation was detected, although the pattern of phosphorylated proteins was different from the pattern characteristic for IgG stimulation (Fig. 2⇓A, lanes 5–8). The isolated proteins associated with MP were also analyzed for the presence of the γ-chain, Lyn, Syk kinases, and SHP-1 tyrosine phosphatase. The γ-chain, the accessory signaling subunit of FcγRI and FcγRIII expressed in J774 cells, was found to be associated with IgG-coated MP at the binding and internalization steps of phagocytosis (Fig. 2⇓B, lanes 1–4). High amounts of Lyn kinase were isolated with the IgG-coated MP at the binding step, while during internalization the Lyn content was reduced (Fig. 2⇓C, lanes 1–4). Analysis of the level of Syk kinase in pellets of IgG-coated MP with the use of Abs against both N and C termini of Syk showed that, at the binding step, only minute amounts of the enzyme were associated with the particles. During internalization, the level of Syk kinase that copelleted with the particles substantially increased, peaking at 10 min for particle engulfment (Fig. 2⇓, D and E, lanes 1–4). As the internalization of particles was accompanied by distinct tyrosine dephosphorylation of numerous proteins, distribution of SHP-1 was next examined. Recently, SHP-1 has been implicated in modulating tyrosine phosphorylation-dependent signaling during FcγR-mediated phagocytosis (18). As shown in Fig. 2⇓F, lanes 1–4, SHP-1 was associated with isolated IgG-coated MP mainly during internalization of the particles. The binding and internalization of control BSA-coated MP engaged smaller amounts of Syk and SHP-1 (Fig. 2⇓, D–F, lanes 5–8). Similarly, less γ-chain and Lyn accompanied phagocytosis of the control particles compared with that of the IgG-coated MP (Fig. 2⇓, B and C, lanes 5–8). Association of Lyn and Syk kinases and other signaling proteins of FcγRs with IgG-coated particles at various stages of phagocytosis. To induce FcγR-mediated phagocytosis, J774 cells were exposed to IgG-opsonized MP (lanes 1–4). As controls, BSA-coated MP were used (lanes 5–8). At different steps of phagocytosis—binding of particles (B) and internalization (I)—the cells were solubilized in Triton buffer, and MP were separated by a magnetic particle separator. The magnetic pellets were boiled in Triton-SDS-sample buffer, separated by 10% SDS-PAGE, and immunoblotted with anti-phosphotyrosine (A), anti-γ-chain (B), anti-Lyn (C), anti-Syk (either N-19 (D) or C-20 (E) Abs), and anti-SHP-1 (F). Positions of molecular mass markers (kDa) are on the left. Tyrosine-phosphorylated proteins are indicated by arrows on the right. Relative amounts of the γ-chain and downstream signaling molecules of FcγRs were estimated in the cellular compartments at different steps of phagocytosis. In resting cells, the γ-chain and Lyn kinase decorated by 10-nm gold particles were observed in comparable amounts under the plasma membrane and in the cytoplasm (Fig. 3⇓, A and D). The total number of gold particles in these compartments was 23–32 gold particles/μm2 (Fig. 4⇓, A and B). Under the plasma membrane and in the cytoplasm, the gold particles attributed to the γ-chain existed as a mixture of individuals and aggregates of various sizes (Table I⇓). In these cells, Lyn located in the vicinity of the plasma membrane was decorated mainly by single gold particles. In the cytoplasm, Lyn was marked with gold particles more heterogeneously; a mixture of individuals (34% of total), small aggregates of 2–4 and 5–7 particles (∼40% of total), and some numbers of large aggregates containing over 12 gold particles (∼26% of total) were seen (Table I⇓). Under these conditions, the majority of total Syk kinase decorated by both N- and C-terminal-specific Abs was located in the cytoplasm as demonstrated in Fig. 3⇓G for Ab N-19. Syk in the cytoplasm was revealed by 29 ± 4 and 39 ± 5 gold particles/μm2 occurring as individuals and also as small and large aggregates (Fig. 4⇓, C and D; Table I⇓). Under the plasma membrane, Syk was displayed predominantly as individuals (76.5% of total for N-19 and 52% for C-20 Abs) (Table I⇓). However, only 6–8 gold particles/μm2 were found there (Fig. 4⇓, C and D). The distribution of SHP-1 resembled the cellular distribution of Syk with the majority of the phosphatase located in the cytoplasm (26 ± 3 gold particles/μm2) (Figs. 3⇓J and 4E; Table I⇓). The quantification of tyrosine-phosphorylated proteins showed that they were mainly located in the cytoplasm (Fig. 3⇓M). The total number of gold particles attributed to the phosphoproteins in this compartment was 42 ± 8 gold particles/μm2 (Fig. 4⇓F), and they were distributed mainly as individuals and as medium aggregates of 8–11 gold particles (both 37.5% of total) (Table I⇓). Under the plasma membrane, phosphotyrosine decoration was observed at a density of 22 ± 2 gold particles/μm2 (Fig. 4⇓F) and was displayed as individuals (56% of total) and as small aggregates of 2–4 and 5–7 gold particles (44% of total) (Table I⇓). Redistribution of Lyn and Syk and other signaling proteins during FcγR-mediated phagocytosis revealed by immunoelectron microscopy. Unstimulated J774 cells and cells exposed for 10 min at 4°C to IgG-opsonized ZA (binding) followed by 10 min at 37°C (internalization) were fixed and processed to visualize the following: γ-chain (A–C), Lyn (D–F), Syk with the use of N-19 Ab (G–I), SHP-1 (J–L), and tyrosine-phosphorylated proteins (M–O). In control samples (P–S), rabbit IgG were applied instead of the primary Ab. Quantification of signaling proteins in cellular compartments during FcγR-mediated phagocytosis. Unstimulated J774 cells and cells exposed for 10 min at 4°C to IgG-opsonized ZA (binding) followed by 10 min at 37°C (internalization) were fixed and prepared for immuno electron microscopy studies as described in Fig. 3⇑. The number of gold particles per square micrometer was next quantified in the cytoplasm, at the plasma membrane unoccupied by IgG-coated ZA, at the membrane under bound ZA, and in the phagosome region. The distribution of the γ-chain (A), Lyn (B), Syk decorated either with the use of N-19 (C) or C-20 (D) Abs, SHP-1 (E), tyrosine-phosphorylated proteins (F), and control IgG (G) was evaluated. The data are the means ± SE of five experiments. In stimulated cells, the binding of IgG-coated ZA to the cell surface induced a redistribution of the γ-chain and Lyn kinase. High amounts of these proteins were visualized under the plasma membrane beneath the bound particles (Fig. 3⇑, B and E), reaching up to 51 gold particles/μm2 (Fig. 4⇑, A and B). Among them, ∼50% of the gold particles were organized in large aggregates containing over 8 gold particles per cluster (Table I⇑). The region of the plasma membrane outside the bound IgG-coated ZA was poorer in gold particles, 10 ± 1 and 15 ± 1 gold particles/μm2 for the γ-chain and Lyn, respectively; also, small amounts of gold particles per square micrometer were found in cytoplasm (Fig. 4⇑, A and B). In contrast to Lyn, no significant amounts of Syk were observed beneath bound IgG-coated ZA (8–12 gold particles/μm2) (Figs. 3⇑H and 4, C and D). Similarly, under the plasma membrane not occupied by ZA, only 5–8 gold particles/μm2 were counted (Fig. 4⇑, C and D). The main pool of Syk was still present in the cytoplasm (25 ± 4 and 27 ± 3 gold particles/μm2 for N-19 and C-30, respectively) where gold particles occurred mainly as singlets and as small aggregates containing up to 4 gold particles (Fig. 4⇑, C and D; Table I⇑). The pattern of distribution of SHP-1 at this stage of phagocytosis reflected the localization of Syk kinase, and the phosphatase remained dispersed in the cytoplasm, avoiding regions of bound particles (Figs. 3⇑K and 4E; Table I⇑). The results of counting gold particles specific for tyrosine-phosphorylated proteins indicated a significant number of the label under the bound IgG-coated ZA (Fig. 3⇑N), reaching up to 87 ± 17 gold particles/μm2 (Fig. 4⇑F). The phosphotyrosine decoration diminished under the plasma membrane not occupied by ZA to 17 ± 2 gold particles/μm2, and to 33 ± 3 gold particles/μm2 in the cytoplasm (Fig. 4⇑N). The appearance of large clusters containing over 15 gold particles attributed to phosphoproteins under bound IgG-opsonized ZA correlated with high amounts of aggregated γ-chain and Lyn kinase found in this cellular compartment (Table I⇑). Internalization of IgG-coated ZA induced a new distribution of the kinases and SHP-1 in the cell. In the phagosomal region, the amount of Lyn was dramatically decreased and only 13 ± 2 gold particles/μm2 attributed to the kinase were found (Figs. 3⇑C and 4B). The large aggregates of Lyn observed at bound ZA dispersed during internalization; only singlets (49.5% of total) and small aggregates up to 7 gold particles (50.5% of total) were detected around phagosomes (Table I⇑). In parallel, the number of gold particles attributed to Lyn in the cytoplasm and under the plasma membrane was elevated to 29 ± 3 and 20 ± 3 gold particles/μm2, respectively (Fig. 4⇑B). The majority of the particles were individuals, 46 and 41% of total, respectively (Table I⇑). During internalization of IgG-opsonized ZA, the γ-chain still accumulated around phagosomes, forming small clusters (Figs. 3⇑C and 4A; Table I⇑). In contrast to the scarce labeling of Lyn, the phagosomal region was heavily decorated by anti-Syk Abs (Figs. 3⇑I and 4, C and D). The particles occurred mostly as aggregates composed of over 8 particles per cluster (∼50% of total gold particles) when probed with the N-19 Ab. The C-20 Ab revealed small clusters of Syk (Table I⇑). At this stage, the total number of gold labels in the cytoplasm and under the plasma membrane resembled the Syk decoration detected earlier in these compartments (Fig. 4⇑, C and D). The level of tyrosine-phosphorylated proteins around phagosomes was reduced 2-fold to 50 ± 3 gold particles/μm2 in comparison to the amounts of phosphoproteins under the plasma membrane beneath the bound ZA, and large aggregates of gold particles were no longer visible (Figs. 3⇑O and 4F; Table I⇑). The decrease of protein phosphorylation in phagosomal regions correlated with significant local enrichment of SHP-1 (Figs. 3⇑L and 4E; Table I⇑). In control samples incubated with irrelevant Abs, or in which incubation with the primary Abs was omitted, only a few singular and regularly distributed gold particles were seen, independent of the stage of phagocytosis (Figs. 3⇑, P–S, and 4G; Table I⇑). The mechanism of spatial and time-dependent engagement of Src and Syk family kinases in the transduction of phagocytic signal is poorly understood, and the identity of the “initiating” kinase that phosphorylates tyrosine residues within ITAM of FcγRs is questionable. In our studies, we focused on the question of the involvement of Lyn and Syk kinases at different stages of FcγR-mediated phagocytosis distinguished by processing experiments consecutively at 4°C and 37°C. The data presented here indicate that there is a sequential participation of Lyn and Syk kinases in the phagocytosis of IgG-coated particles. Our immunoelectron microscopy data demonstrated that only Lyn accumulated under the bound particle (4°C), whereas Syk and SHP-1 phosphatase were found in the periphagosomal region where particle internalization took place (37°C). Tyrosine phosphorylation of numerous proteins occurred when particles interacted with FcγRs on the cell surface, and later, during particle internalization, the level of the protein phosphorylation decreased (Figs. 3⇑ and 4⇑; Table I⇑). The isolation of IgG-coated MP at different steps of phagocytosis confirmed that, during binding of particles, Lyn and the major fraction of phosphorylated proteins were associated with MP. The engulfed particular material was mainly occupied by Syk and SHP-1 and smaller amounts of phosphorylated proteins (Figs. 1⇑ and 2⇑). Analysis of the engagement of Src and Syk family kinases and the appearance of phosphoproteins at different steps of phagocytosis indicate that the accumulation of Lyn kinase at the binding sites correlates with abundant phosphorylation of numerous proteins, thus suggesting the initiating role of Lyn in the phagocytosis. The role of Src family kinases in phosphorylation of the γ-chain was clearly demonstrated in hck−/−fgr−/−lyn−/− macrophages in which no induction of the γ-chain phosphorylation was detectable after FcγR cross-linking (12). These data are consistent with a report showing a role of Src family kinases in the phosphorylation of ITAM of FcγRIIA in THP-1 cells by a pharmacological approach (19). Furthermore, the authors revealed strong tyrosine phosphorylation of FcγRIIA in COS-7 cells cotransfected with Lyn, but not with Syk. Engagement of Src family kinases in the phosphorylation of ITAM of other immunoreceptors, including TCR, BCR and FcεRI, is generally accepted (20, 21, 22). Using a two-hybrid system, immunoprecipitation, and chemical cross-linking, it was demonstrated that a small fraction of Src kinases (e.g., Lyn for FcεRI) was constitutively associated with immunoreceptors. This fraction of the enzymes can be responsible for the initial phosphorylation of the activated receptors. Phosphorylated ITAMs serve as the docking site for additional molecules of Src kinases recruited to the activated receptors (Refs. 23, 24, 25 and 26 and references therein). Subsequent dissociation of Lyn from highly phosphorylated FcεRI is required for the docking of Src homology 2 domains of Syk and signal progression (27). Sequential engagement of Src and Syk kinases was also considered for FcγRIIA signaling and FcγR-mediated phagocytosis (10, 19, 26, 28, 29, 30). In contrast, in hck−/−fgr−/−lyn−/− macrophages, FcγR-mediated phagocytosis accompanied by Syk activation and actin assembly still occurred but in a delayed and diminished fashion. These cells treated with PP1 still maintained the ability to engulf the particles (12). Thus, Src family kinases seem not to be absolutely required for initiation of the phagocytic signal. Instead, a line of evidence points to Syk as the initiating kinase, suggesting that a small number of Syk/ITAM complexes can constitutively exist in resting cells (31). In accordance with this, activation of FcγRs in macrophages derived from Syk-knockout mice did not induce phosphorylation of the γ-chain (32), and inhibition of Syk activity by treatment of platelets with 100 μM piceatannol resulted in significant inhibition of FcγRIIA phosphorylation (33). However, there is a possibility that, in the absence of Syk, tyrosine residues of ITAM phosphorylated by Src kinases were not protected against the action of tyrosine phosphatases, and, as a result, no ITAM phosphorylation was detected (32). Furthermore, careful investigation of Majeed et al. (34) cast doubt on piceatannol specificity, indicating that prolonged incubation of cells with the drug at concentrations exceeding 25 μM results in inhibition of both Syk and Src family kinases. Nevertheless, several findings showed that recruitment of Syk to activated immunoreceptors, including BCR, FcεRI, and FcγRs, was rapid (e.g., Refs. 4, 21, 35 , and 36). Syk was also found in phagocytic cups during FcγR-mediated phagocytosis (33). However, it should be noted that, in these studies, the receptors were activated at 37°C either by cross-linking or by binding with simultaneous internalization of IgG-coated particles. This temperature mimicked physiological conditions but may hamper elucidation of the assembly of multimolecular signaling complex due to the fast processing of this event. In contrast, our experimental approach in which binding of particles at 4°C blocked particle internalization allowed the distinction of some of the signaling events attributed to distinct stages of phagocytosis. In our studies, minute amounts of Syk were found to be recruited during the binding of IgG-coated particles. For detection of Syk, Abs specific against the N and C termini of the kinase were applied to overcome sterical hindrances of accessibility of the Abs to their epitopes. Similar results were obtained with the two different Abs indicating that the plausible epitope masking caused by the interaction of N-terminal Src homology 2 domains of Syk with phosphorylated ITAM was not observed. However, we cannot exclude that the low temperature during particle binding could reduce the diffusion of Syk, as well as SHP-1, in the cytoplasm and diminish the solubility of cytosolic proteins affecting the amounts of Syk and SHP-1 found at the membrane under bound particles. In addition, the low temperature could favor the enzymatic activity of Csk/Lyn over that of Syk and tyrosine phosphatases, thus magnifying the accumulation of Lyn and tyrosine-phosphorylated proteins under the bound particles. Despite these perspectives, we believe that our experimental approach revealed that Src family kinases can fulfill the initiating role in protein phosphorylation during FcγR-mediated phagocytosis. This may be facilitated by docking of the Src kinases in the FcγR-bearing plasma membrane and compartmentalization of Syk in the cytoplasm. Recently, it has been suggested that activated Src family kinases can promote actin polymerization and formation of phagocytic cups either through Syk or without Syk engagement, as demonstrated in hck−/−fgr−/−lyn−/− and syk−/− macrophages (12, 14) and in J774 cells (37). Syk is indispensable for phagocytosis, because down-regulation of its expression in monocytes (13) and in macrophages (14, 32) abrogate internalization of IgG-coated particles. A chimeric protein, containing the extracellular and transmembrane domains of FcγRIII and catalytic domain of Syk kinase as the cytoplasmic part, was efficient in triggering actin filament polymerization and internalization of particles (15). However, in Syk-deficient macrophages, the formation of actin-rich phagocytic caps was not disturbed (14). Thus, Syk kinase may play a critical role in closing phagosomes and internalization of particles. Under conditions in which expression of Src family kinases is experimentally diminished or their activation is circumvented, Syk may solely trigger actin rearrangement and phagocytosis. Recently, the engagement of Src family kinases in the tyrosine phosphorylation of immunoreceptors was strongly supported by elucidation of a crucial role of cholesterol/sphingolipid-rich membrane domains (rafts) in this process (38, 39, 40, 41). The rafts are places of concentration of Src kinases (38), but not Syk family kinases (42). Cross-linked FcγRII associates with rafts containing Lyn and undergoes phosphorylation by Src family kinases (41, 43). Later, Syk is recruited to clusters of the cross-linked FcγRIIA (our unpublished data). The engagement of the Src kinases residing in rafts in generation of phagocytic signals by FcγRs was recently suggested (10). From this point of view, it is of interest that large clusters of the γ-chain, and particularly prominent clusters of Lyn and tyrosine-phosphorylated proteins, were revealed during the binding of IgG-coated particles (Table I⇑). These observations support the assumption that clustering of FcγRs triggers signal transduction at the onset of phagocytosis (2, 44) and may point to the involvement of membrane rafts in this process. We thank Dr. Marie-Helen Jouvin (Beth Israel Deaconess Medical Center) and Dr. John C. Cambier (University of Colorado) for generously providing rabbit anti-γ-chain 934 and rabbit anti-SHP-1 Abs. We also thank Dr. Patrick Groves for his critical reading of the manuscript. ↵1 This work was supported by Grants KBN 0582/P05/99/16 and KBN 0999/PO4/2000/18 from the Polish State Committee for Scientific Research. ↵3 Abbreviations used in this paper: ITAM, immunoreceptor tyrosine-based activation motif; SHP-1, Src homology 2-containing tyrosine phosphatase-1; LB, latex bead; MP, magnetic particle; TX-100, Triton X-100; ZA, zymosan A; PD, phosphated Dulbecco’s. Strzelecka, A., A. Sobota. 1999. Translocation of tyrosine kinase Lyn and Syk during Fcγ receptor-mediated phagocytosis. J. P. Thiery, ed. In NATO Science Series: Life Sciences Vol. 309: 203 IOS Press, Amsterdam. Silverstein, S. C., S. Greenberg, F. Di Virgilio, T. H. Steinberg. 1989. Phagocytosis. W. E. Paul, ed. Fundamental Biology 703 Raven, New York.